The AK-47 rifle, which first went into service with the former Soviet Union in 1949, is perhaps the most storied and ubiquitous military weapon of modern times. As everyone knows, it’s also been the darling of “irregular” forces—guerillas, jihadists and every stripe of revolutionary in the lexicon. Since its inception the gun has been copied, licensed and cloned in a number of countries. The technology has evolved and a host of modern AK variants have been produced in China, Hungary, Israel, Yugoslavia, Bulgaria, Finland and Iraq, just to name a few. Of all the variations on the theme, perhaps the most sophisticated to emerge out of this evolutionary succession to date is the SIG 550 series. Recently, On Target’s staff had an opportunity to review a recent example of the Swiss’ engineering efforts, the SIG-USA R556. We were attracted to the R556-762R-16B model in particular because of the mix of features it offers: a robust, easy-to-maintain, refined Kalashnikov bolt / piston gas system; useful .30 caliber cartridge (7.62×39 Soviet round); easy AR-style push pin disassembly of upper and lower giving clear access to internal parts; use of easily obtained standard AK magazines; and a fixed, robust upper receiver (as opposed to the usual stamped, removable AK receiver cover), that provides a stable platform for the attachment of optics. Leave it to the Swiss to re-engineer a solid, but by modern standards klunky weapon, and turn it into one of the most sophisticated AK-inspired rifles on the market. The R556 model we reviewed was from the “2nd generation”. The most important features of this revision include a more robust, solid, non-adjustable Swiss style folding stock, and a steel insert fitted at the front of the magazine well to accept the front AK magazine-locking lug. This latter refinement is especially important to prevent accelerated wear to the lower aluminum receiver, which was found to happen when using steel AK magazines in the non-reinforced 1st generation version. 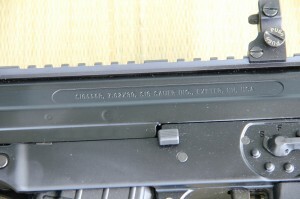 The date of manufacture listed on the box for our 2nd generation carbine is July 18, 2012. Our R556 was delivered with a hard plastic piece inserted into the front sight dovetail. We’re not sure why SIG-USA added that bit. Maybe it was an effort to make the carbine look more “finished”? Whatever the reason, we removed it so that we could add folding BUIS. 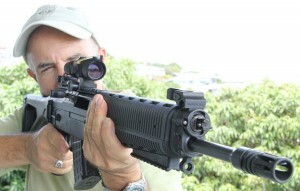 We selected Samson flip-up sights, since they make a set specifically for the 556. They seem well-made, and attach to the 556R easily, but they do wobble front to back a bit when deployed. This did not seem to affect accuracy out to 50 yds, at least not in our tests. 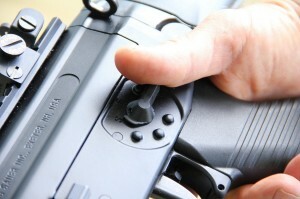 The front and rear sights are spring loaded and pop up automatically at the push of a button, one of which is located at the base of each sight block. The length of pull with the supplied folding stock was satisfactory for the average sized shooter but proved short for another member of the staff who was 6’1″.The carbine was delivered with a spare buttplate that is meant to allow the user to increase the length of pull as required, but unfortunately the piece will not work with the new stock as fitted. It was meant for the older model folding stock that is also adjustable for length, but which was replaced by SIG in response to well-deserved criticism of its lack of stability. We could still shoot the R556 fine, but we feel that accuracy and comfort would be enhanced for taller shooters if the carbine were available with a longer stock. We tested the rifle both with the BUIS and optical sights. (Not all of us have the vision of a 20 year old!). We chose a Trijicon ACOG for use on the R556; model TA24-4. The cross hairs of our unit are amber, and stand out well in low light conditions. During the day in bright conditions the cross hairs appear black. The optic is 1.5 power, with an objective diameter of 24mm. The great feature of this optic for us is that it can be used it with our distance glasses. This allows us to keep target and cross hairs in sharp focus while looking through the optic, making accurate sighting much easier. Our ACOG is equipped with the Trijicon special ring mount, which allows the optic to ride low on the rail. This makes a decent cheek weld much easier for us to maintain on the stock of the R556. Our carbine came supplied with red dot from SIG-USA, but we’ve not taken it out of the box and cannot comment on its function. 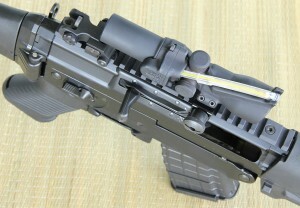 The magazine that came packed with the carbine is commercial Bulgarian polymer AK, of 30 round capacity. The fit is slightly wobbly from side-to-side, but that doesn’t seem to affect feeding. And it rocks in easily and securely front-to-back. Before taking the SIG to the range for the first time we stripped, cleaned and lubed it. Field stripping is a bit different than an AK, but the procedure is well documented in the supplied manual and is straightforward with no surprises. SIG thought out the maintenance features well. We like the easy access to internals very much. On our first trip to the range we took along the supplied Bulgarian mag, a 5 round Arsenal mag, and a Hungarian steel 20 round mag. The Hungarian mag locks in with little or no wobble. The Arsenal 5 rounder moves slightly from side to side, but is otherwise firm. Feeding from all 3 mags was trouble-free, with no stoppages of any kind. We fired 80 rounds at the range, in lots of 5. 5 is the maximum that our range rules will allow to be loaded in a mag at one time, so we could not test the mags at full capacity there. We sighted in the BUIS at 50 yards, and the ACOG at 100 yds. It was easy to get the carbine on target, as we had done an initial bore sighting with a laser. Firing from a wooden rest on the bench we were able to easily keep our rounds confined to a 4 inch circle using Silver Bear ammo, both using BUIS at 50y ds and the ACOG at 100 yds. We have no doubt that the carbine is capable of better in the hands of a skilled marksman. The SIG ran through all 80 rounds of Silver Bear with no failures of any kind. We found the R556 to be very pleasant to shoot, with mild recoil. Though it has some muzzle jump, the effect is not overly distracting. Ejection from the R556 is very positive, with cases landing 12-15 feet to the right in the 3:30 position. The trigger has some initial takeup slack, but reaches a distinct stop. Increasing pressure slightly after that drops the hammer. Trigger pull is consistent, smooth, and light. There is no trigger “slap” (an idiosyncrasy of some AK models). On the next outing we took the R556 to a gravel pit on the Mainland along with the Hungarian 20 round steel mag, a Bulgarian steel-reinforced polymer 30 round mag, a “smooth side” Tapco 30 round polymer mag, and a ribbed Tapco polymer 30 round mag. Through the course of the day we expended 260 rounds of Silver Bear through the R556, using all of the mags, each mag starting with a full capacity load of 20 or 30 rounds as per capacity. There were no failures to feed or eject with the Hungarian, Bulgarian, or Tapco ribbed mags. 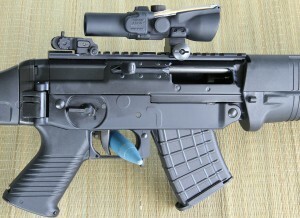 With the Tapco “smooth side” mag the carbine would regularly fail to fully chamber a round every 2nd or 3rd cycle. After a few full loads the Tapco “smooth side” mag showed signs of improvement, so maybe it just needs a breaking in period. Overall we were very happy with the 2nd Generation R556. We found it to be compact and easy to maneuver, accurate, a heckuva lot of fun to shoot, and (with the right magazines), monotonously reliable. Takedown and cleaning are easy too. The only things we found awkward were the position of the safety lever, which is hard to reach when the carbine is shouldered in firing position, and the short length of pull, which can be uncomfortable for a tall shooter. Would we recommend this carbine?